Two tiny asteroids zipped close by Earth today (March 26), passing between our planet and the orbit of the moon, but posed no threat of impacting our world, NASA scientists say. The two space rocks flew by Earth in rapid fire; one zoomed by early in the day while the second buzzed the planet at 1:09 p.m. EDT (1709 GMT), according to astronomers with NASA's Asteroid Watch program. "Both are very small (under 10 meters) and pose no risk," the scientists wrote in a Twitter update. The first object, called asteroid 2012 FP35, came within 96,000 miles (154,000 km) of the Earth when it passed by earlier today, the scientists wrote. 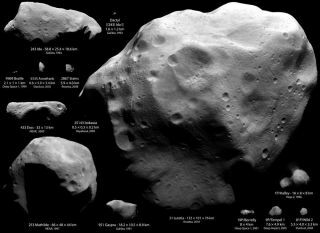 Asteroid 2012 FP35 is just under 30 feet (9 meters) wide, making it about the size of a tour bus. The second asteroid is dubbed 2012 FS35 and crept even closer to Earth, coming within 36,000 miles (58,000 km) when it whipped by the planet. Asteroid 2012 FS35 is even smaller than its predecessor; at nearly 10 feet (3 meters) wide, it's only the size of a small car. The paths of both asteroids brought them well inside the orbit of the moon, which typically circles Earth at a distance of about 238,000 miles (382,900 km). Asteroid 2012 FP35 — the farther of the two space rocks — passed within 0.4 lunar distances to Earth, while asteroid 2012 FS35 came within 0.17 lunar distances, NASA scientists said. The two asteroids were first detected over the weekend and quickly dismissed as potential impact threats to Earth. Their small size means they would likely not survive the fiery trip through Earth's atmosphere to reach the surface. NASA's Asteroid Watch project is part of the agency's Near-Earth Objects program based at the Jet Propulsion Laboratory in Pasadena, Calif. NASA scientists and other teams of astronomers regularly scan the sky for larger, potentially dangerous asteroids in order to determine if they pose a risk of impacting the Earth.